We Make the Most of Precious Time | Sprezzatura, Y'all! We crawled into bed Thursday night at midnight. As we were getting settled in, it occurred to us that in exactly one week at that very moment we would be in the Atlanta airport. Then we sighed heavily and went to sleep with less than one week left in our adopted country. Our last few days left in Anghiari are busy with saying goodbyes to our friends and favorite places, mostly through having lunches and dinners. Thursday night we went to an olive oil-themed dinner at one of the restaurants in town, La Nena. There were three featured olive oils and they were showcased in a five course dinner. Seating was family style and we were at a table with an Italian man and his Japanese wife, an Italian man and his daughter (who owned one of the olive oil companies featured), and an American couple who have been living in Anghiari for almost 20 years. It started at 8:30 and we walked out of there at 11:30. The food and the company were both wonderful and events like this are one of the things we’ll miss most about living here. Oh, and did I mention that there was also unlimited wine paired with each course? The cost per person? 25 euro. Friday we drove to Montepulciano, a beautiful hill town south of here known for extremely good wines and breathtaking views. The day was a little overcast, but the views were still tremendous. 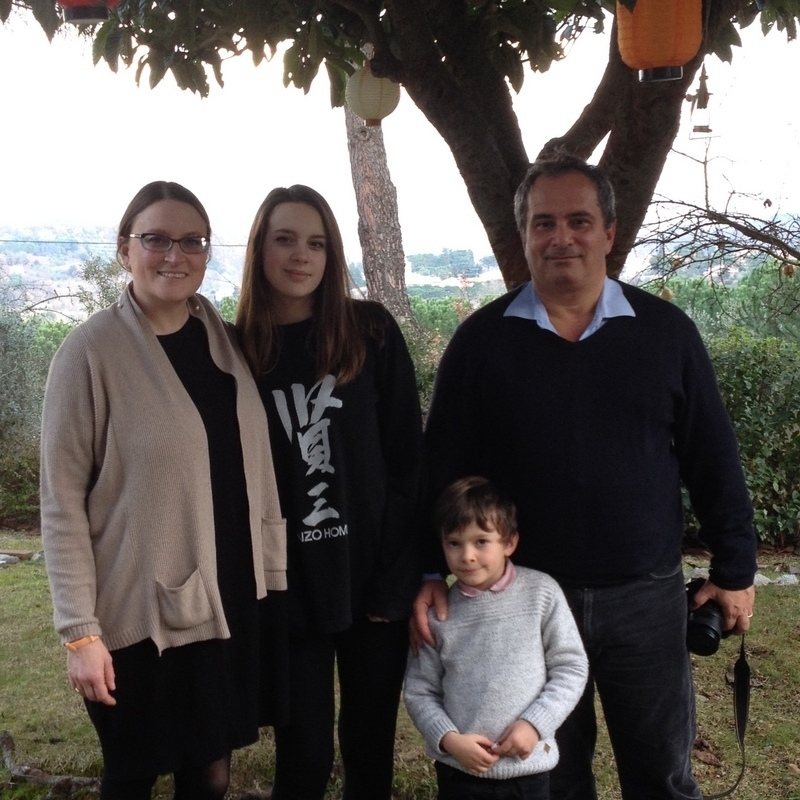 We had lunch with Francesco and Olivia and their family. Francesco is a professional acquaintance of our daughter-in-law. They are both Egyptologists and they met at a conference in the U. S. last year. They have been collaborating on some things and somehow we got involved and wound up there for lunch. What a delightful afternoon. They have two children. A beautiful 16 year-old daughter and a rambunctious six year-old son. They live on top of a hill just outside Montepulciano in a new house, certainly by Italian standards, that was built in the 1960’s. The views are incredible. The house has huge windows on all sides to take in the view from each room. It’s truly a spectacular place. Lunch was simple and wonderful. Salami to start, pici pasta with ragu, salad, fruit and cheese, and a traditional dessert served during Carnivale. It’s called different things in different regions of Italy, but it’s the same bits of thin, crumbly dough, fried, then covered in powdered sugar. Olivia is from Rome and she knows them as frappe – but Francesco is from Tuscany and they’re called chiacchiere there. Whatever they’re called, they’re crispy strips of goodness that melt in your mouth. We drove back to Anghiari late that afternoon, regrouped a little, then went to Rosella’s for dinner. Michelangelo is in the U.S. on business, so we won’t see him again this trip, but Rosella and their daughter Anna asked us to come over for one last dinner together. They did a collaboration on the meal. Anna made the pasta, which was orecchiette (little ears) with a tomato and ricotta cheese sauce. Rosella did vitello milanese – lightly breaded, thinly sliced veal that are fried in olive oil. Yum. Roasted potatoes, salad and grilled lamb spiedini (kabobs). They are funny in the kitchen together – each with her own method and style, but it’s Rosella’s kitchen and she monitors everything. Millie loves going there and it’s like a second home to her. They live on a hill out in the country near Citta di Castello and every time we turn off to their road, Millie knows where she’s going and starts to get excited. She goes crazy when she sees them and it’s a little sad to think that was her last trip to Val di Petrina (the name of their road). 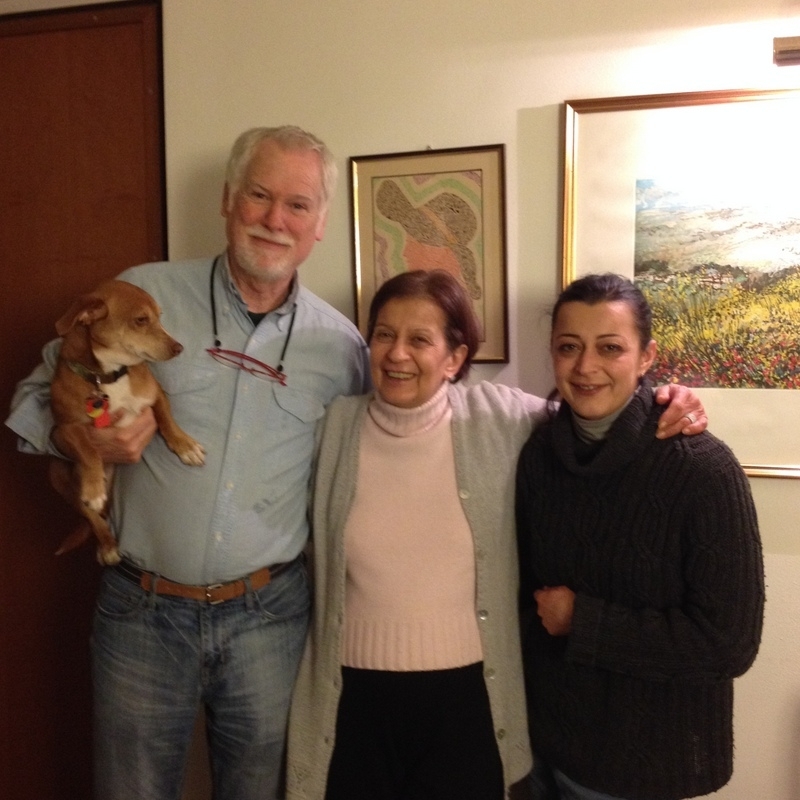 The next day, we had lunch with our landlord and friend, Giovanni and his family at their home. It was a very special time for us. They have welcomed us into their family and have made us feel so welcome here. They have included us in many family gatherings over the months, provided us a wonderful, incredibly affordable apartment and a quirky, but fun, car. We originally learned of this town because of them and have transitioned from business partners to friends over the years. Usually when we have lunch or dinner there, it’s a big affair with many guests in their formal dining room. This lunch was very casual in a small family dining room. 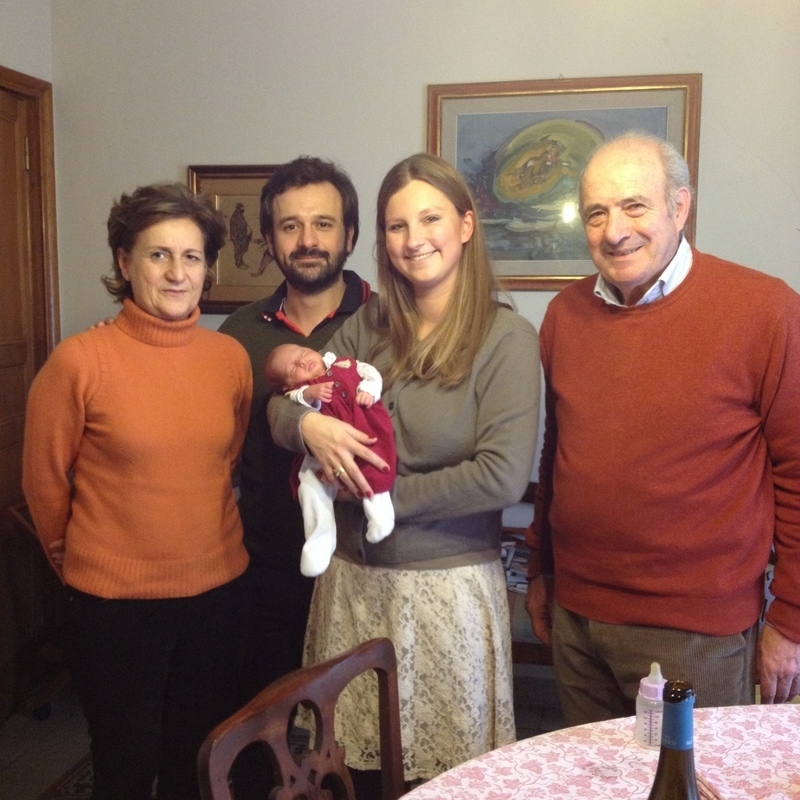 Anna and Livio and their one month old baby, Sophie, were there as was Paola’s 93 year old father. We talked about our time here and our hopes to return someday. We found out about some of the most colorful characters in town and what their stories are. They have always made us feel welcome, but this time we really felt like a part of the community. I think it’s fair to say that without this relationship, this adventure would not have been possible. And for that we are forever grateful. We have written notes to a few very special people here, people who have gone out of their way to make us feel welcome. The family who owns the restaurant downstairs from us is one of them. We stopped in after lunch to make sure they would be around later so we could visit with them. It turned out that the son, Mattia was leaving today to go back to Siena where he goes to college and the restaurant would be closing after Sunday for eleven days. So it was the last time to visit with Mattia. Mattia is a young, early 20’s guy who thinks America is the greatest thing in the world. He would trade place with us in a second if he could, although Atlanta is not where he wants to be. He wants to be in New York, of course. We said our goodbyes to him and we’ll visit with Veronica, his sister, and Cristina, his mother, on Sunday before they close. While we were saying our goodbyes to Mattia, they gave us a bottle of wine and a beautiful book of the art of the area. What a wonderful, kind gesture. We all teared up and hugged and kissed on both cheeks. It means so much to me that they would think to go out and get us a going away gift. As much as we love being here, I think it means more to us that the people here have loved having us here. Very gratifying. Americans sometimes don’t have the best reputation here, so it’s good to know that they think highly of us. Almost as highly as we think of them. We went down to the sports bar for a cocktail this evening. We ordered our drinks and told Rossono, the owner, that we had been unable to find the book he showed us a few days ago about WWII in the area. We looked at several places and couldn’t find it. He immediately got on the phone. We weren’t sure why, because Italians are always getting on their phones (sound familiar? ), so we didn’t think anything about it. We got our drinks and went to a table. A few minutes later he came over and said that he thought he had found us a book and would let us know. A few minutes after that, he came over and said that the book was out of print and not available anymore, but we could have his copy and he would try to find another. He had been trying to find us a copy of the book and when he found out that none were available, he offered to give us his. Again, what a beautiful gesture. We told him thank you, but no. If he ran across another copy sometime we would take it but we didn’t want to take his copy. This is what I mean when I say we love it here. Who would do that? A rare, scarce book that can’t be found easily, that you’ve obviously treasured – you’re going to give it to a couple of people you only met a few months ago and hope that you can find another one. Just because we expressed interest in it and found it fascinating. These kind of gestures are worth more than words. They’re genuine and heartfelt and they make us feel so humble. Beautiful. Tomorrow we’re having a final dinner with our friends Ludo, Barbara, and Ilaria. And that will be the last of the planned gatherings. Time is such a precious thing. This week, we’ll savor every moment. The moments that we’re leaving new friends and the moments that we’re reuniting with old friends. It all happens this week. Leaving a country that we love to return to the country of our birth, which we also love. I wish that for just this one week we could make every second last and last, because it’s a defining week in our lives. But we can’t do that, so we’ll just have to savor each moment. I’m so glad that we have happiness waiting for us in Atlanta – friends and family we haven’t seen in months, familiar surroundings, road signs that we can read, toilets that all operate the same way. How lucky are we to be leaving a place we love to return to a place we love? Probably the luckiest people on earth. Lovely poignant and full of emotion ! Im so sad you are leaving! Such a wonderful vicarious experience Cathy & Steve! Cant wait to see you in the ATL. Hope to get back soon. So beautifully written, Cathy! And to be reminded that our hearts and souls have so much more room for love and happiness than we sometimes allow.